I wish I had worn my braces when I was younger! I want straight teeth now but I couldn’t wear train tracks! It will take too long and cost a fortune! These are comments that I hear from patients very frequently and yes we tend to assume that orthodontic treatment is the preserve of the young. Patients also tend to view orthodontics purely from an aesthetic point of view and often chide themselves for even considering treatment in the name of vanity! Orthodontics is one of the most effective and least invasive ways of achieving straight teeth. It is a popular choice for both adults and children. Straight teeth are usually healthy teeth, maintenance is easier and this reduces the chances of tooth decay and gum disease. This is as true in teenage years as it is mid to late life. Orthodontics in adults is now common place. The technology has advanced to allow braces to be practically invisible. The metal bits can be fitted to the back of your teeth or ceramic and clear wires can make the train tracks disappear. Justin Evans is an internationally renowned orthodontist .who is a visiting specialist at The Mayhill Dental & Specialist Centre . Justin can be relied on to offer simply the best treatment and outcome for his patients. He will make sure all options are visited and discussed for each individual. His experience, patience and understanding puts his patients immediately at ease. 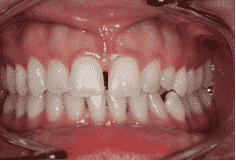 Justin has young children himself and so is aware of the tactics involved in gaining the trust and compliance of young individuals embarking on orthodontic treatment. He can make the process fun and celebrate the virtues of straight healthy teeth. At The Mayhill we are committed to excellence and accessibility to treatment. Orthodontic treatment often entails awkward appointment times and an interminable waiting list. We will see you at your convenience and look forward to helping you and yours. We also offer 0% finance to help patients spread the cost of treatment. For more information or to make an appointment please call 01600 712020 or email info@themayhill.co.uk. The answer is not simple. Our smiles like our eyes are a window to our personalities and reflect our mood and emotions. 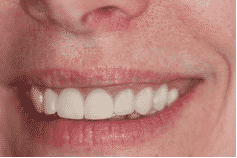 I often see faces light up with an engaging and open smile only to be swiftly hidden away with self consciousness and embarrassment caused by dark, stained or uneven teeth. Paradoxically if we think of people with beautiful smiles they rarely have perfect teeth. 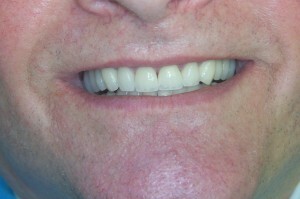 We are often approached by patients who request smile makeovers or redesign. Our first action is to make sure that their dentitions are fundamentally healthy prior to any aesthetic considerations. 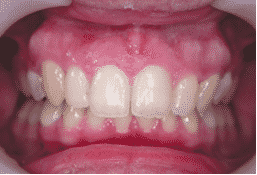 The colour shape and contour of the pink stuff (gums) is just as important as the white stuff (teeth). Healthy smiles need healthy gums. The next step for us is to gauge the patient`s disposition and expectations. There may be an obvious problem that requires simple non invasive treatment. In other cases a good deal of discussion between patient and clinician is required perhaps in a non clinical environment. We have an extensive library of cases we have previously treated and even animation of the procedure itself. In complex cases we will take study models on which we rehearse the intended treatment. Patients are given written treatment plans usually with a number of options. We usually have a secondary consultation to enable us to address any concerns or questions the patient may have. Broadly speaking there are three areas where aesthetic concerns arise. Colour: As our teeth age, become progressively darker. Many foods and drinks will cause further staining. Bleaching techniques can safely and reliably reverse this. Our preferred product is Enlighten which guarantees results and is a very gentle process. Crowding: Many adults perhaps did not have the opportunity or the inclination to have orthodontic treatment in their youth. Although they may regret this they may be unwilling to consider prolonged treatment to straighten them. Cfast™ is a great solution which focuses only on the front teeth with a six month completion time. Crowns and veneers: These are used to treat aesthetic concerns but often become the biggest problem. Poorly fitting with black margins these restorations can give a very disappointing outcome. I am often amazed at what patients will accept. A new generation of ceramic crowns offer resilient and beautiful results. A great smile creates a great impression, personally or professionally. If your smile is less than perfect it can affect your self confidence and the way others perceive you. The revolutionary Cfast orthodontic treatment can straighten your teeth in just 6 months and give you the fantastic smile you’ve always dreamed of! Traditional orthodontics focus on the position of your bite, so can take years of treatment wearing metal braces. 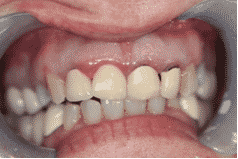 Cfast focus on just the front teeth that make up your visible smile, so treatment time is far less. Cfast cosmetic tooth alignment is fast, discreet, affordable – achieving great looking smiles during as well as after completion of treatment. Cfast is now available at the Mayhill Dental and Specialist Centre. Book now for your free consultation on 01600 712020 or email info@themayhill.co.uk. If you are missing one or more teeth and would like to restore your ability to eat, speak and smile with comfort and confidence, then dental implants may be right for you. Perhaps your dentures don’t fit comfortably or securely or you might have difficulty chewing. Confidence about your smile and teeth can affect how you feel about yourself both personally and professionally. An implant is an artificial replacement for the root portion of a natural tooth, made of titanium. This metal is well tolerated by bone and integrates into the bone tissue well. Dental Implants can be used to replace individual teeth or used as attachments to hold dentures and bridges. Mini dental implants are smaller than traditional implants. These can be placed in thin bone and used to retain dentures. Mini implants have the advantage of immediate placement in thin bone at a reduced cost, but are not strong enough for individual teeth. What are the barriers to treatment? 95% of Implants survive for at least 10 years. The initial costs which are not inconsiderable must be viewed in this context. Implants are placed painlessly with very little post-operative discomfort. Intra-venous sedation is offered to patients who are particularly anxious. A few years ago I saw a lady who had battled with gum disease all her adult life. She suffered for several years with facial pain due to loose teeth. Sadly, her concerns had been ignored by her dentist. Eventually her teeth were extracted and replaced with dentures. She mistakenly believed all her problems were now solved. When I initially saw her she was very tearful as she described her past experiences. This same lady now has fixed teeth, can eat anything she wishes and is totally confident in her appearance. It has now been ten years since we first placed implants for her. Gum disease is the most common cause of tooth loss in the adult UK population. 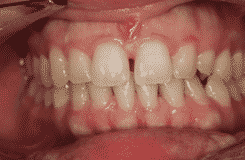 It is caused by bacterial plaque accumulating on gum margins around and between teeth. 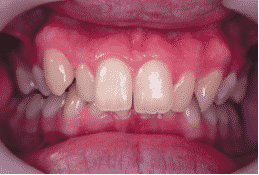 Initially this causes bleeding and swelling (gingivitis) which if left untreated results in pocket formation and bone loss (periodontitis). Teeth become loose, infected and ultimately require extraction. Sadly many patients are not made aware of the problem until it is too late. Your dentist should carry out an assessment of gum health at every examination. Certain groups for example smokers and diabetics can be more vulnerable and there may also be hereditary factors. Recently a link between gum conditions and cardiovascular disease has been suggested. This is not fully proven but is certainly a cause for concern. The good news is that with the correct treatment gum disease can be prevented and in cases where an established condition exists can be halted. A simple scale and polish makes teeth feel fresh and clean but is not an effective treatment. A more thorough approach is required. Dental hygienists are trained to give patients treatment to ensure that even the most inaccessible areas are cleaned. This can be achieved gently and painlessly but requires time. Advanced techniques using local anti bacterial and lasers can also used with good outcomes. The patient needs to be encouraged and motivated to maintain high standards of oral hygiene. The whole mouth looks and feels healthy and the unpleasant side effects like bad breath can be eliminated. Patients who build regular hygiene into their routine have dramatically reduced treatment needs. If you are concerned that you may have issues with your gums then prompt diagnosis and treatment is advisable. Contact the Mayhill Dental and Specialist Centre where you will receive peerless standards of care. An open day is a great opportunity. On one hand we want to show off and market our new practice and on the other it provides patients with an opportunity to meet us and find out what we are all about. We really enjoy meeting patients with our gloves off! It gives us a chance to discuss dental problems and anxieties in an informal way. This can be the first step for many patients who are not enthusiastic attendees or who have worries or concerns over treatment they have received in the past. At our first open day our team will be on hand to give demonstrations and advice on all aspects of dental health targeted at all age groups. Question and answer sessions will be given by David Guppy and Cameron Currie specifically related to dental implants, cosmetic dentistry and almost invisible orthodontics. Our Dermatologist, Louise Hull will also be available for informal consultations on facial aesthetics. You will be very welcome to tour the practice and see for yourself the standards we are setting ourselves. We will be offering very special offers on home bleaching and our membership plans. Please come along and join us. Complimetary bubbly and nibbles will be on offer. The most common cause of dark or yellow teeth is smoking, red wine and tannic acid in tea and coffee. Teeth also darken naturally as we age. Surface staining can be removed by a hygienist but this is usually transient and in time the staining returns. The same is true of whitening tooth pastes which can be very expensive but have a negligible effect on the colour of teeth. Tooth whitening or bleaching as prescribed by a dentist can remove the intrinsic nature of the discolouration and dramatically whiten your smile. The process is well tested and safe when provided by a dental professional. Broadly speaking there are two techniques. In surgery whitening, which often involves a modified light or laser, has fallen out of favour. 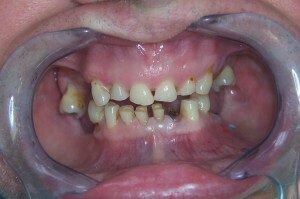 The use of trays and home bleaching is far more reliable but does take longer. The Enlighten system guarantees the B1 natural white shade. It achieves this with very low concentrations of the bleaching agent with little or no sensitivity. The trays are constructed to bleach the whole tooth. The fade back is very slow and foodstuffs or drinks seem to have very little or no effect. If you want to brighten your smile predictably with amazing results contact at The Mayhill Dental and Specialist Centre Tel 01600 712020. People who maintain their chewing ability are probably less likely to develop dementia, compared to those who cannot chew well any more, researchers from the Department of Odontology and the Aging Research Center at the Karolinska Institute. According to previous studies, several factors can contribute to our risk of dementia. Some studies have pointed to a link between having no teeth and losing mental function more rapidly and being more likely to develop dementia. The action of chewing makes more blood flow to the brain. People with few or no teeth will chew less resulting is less blood flow to the brain. The hypothesis is that if there is less blood flow to the brain, the risk of eventually having dementia rises. A team of Swedish researchers set out to determine whether tooth loss and chewing ability might impact on cognitive function. They gathered and examined data on a nationally representative sample of 557 elderly people (aged 77 years or more). They discovered that people who had a problem with chewing hard food, such as apples, had a considerably higher risk of developing dementia. With this in mind it must be the duty of dental surgeons to maintain teeth where ever possible. At the Mayhill Dental and Specialist Centre we have the skills to save teeth that other dentists might condemn. We also have over 20 years experience in placing dental implants to replace teeth that have been extracted. We can restore function which might be even more important than previously thought!